I have just had one wisdom tooth pulled out (extracted) from the upper left hand side of the palate. It was a less than 30 mins job to pull one mighty wisdom tooth that was already infected by caries and it was located pretty much in the back that brushing alone might not be that effective and regular gurgling with mouth wash might help. Good thing the other 3 wisdom teeth are well intact and i am planning to be more conscious when it comes to taking care of my teeth. And today was my very 1st time ever to go through such an experience as an adult. More on wisdom teeth, read here. Now my left cheek looked a bit puffy coz i am biting a thick gauze to stop the bleeding and to speed up the healing process. I have also been prescribed with painkillers that will help ease the after-extraction pain once the 3 anaesthetic jabs effect i had withdraw. Seriously, it does not look good at all, that tooth as it is full of cavities but the bone structure is mighty strong. It was nearly an inch size when i saw it placed on the dentist bowl next to my seat. Gigi tu memang power, uols. I did it FOC uols. Because it is a UKM campus clinic. #1. Do not neglect washing our mouth with a proper mouthwash as brushing alone is not totally effective and dental flossing cannot totally remove the debris between our teeth especially when it is so far behind like wisdom teeth. #2. Love your teeth. Take care of them more often and have it descaled at least twice a year. RAFAEL Nadal's unbeaten record at Roland Garros is officially shattered by his shocking loss to Swiss 23rd seed Robin Soderling 6-2, 6-7 (2), 6-4, 7-6 (2) on Sunday afternoon. Another not so big upset was seeing 8th seeed Ana Ivanovic, the 2008 FO champion off too beaten by Belarusian 9th seed Victoria Azarenka. See I told u there're gonna be a few UPSETS soon. But I did not see it coming for Nadal. Poor poor baby. This is also rather shocking as the most defeat Federer ever had so far as no.1 on a Grand Slam turf was losing in the semi. And Nadal had to bye bye us now in the FOURTH round. 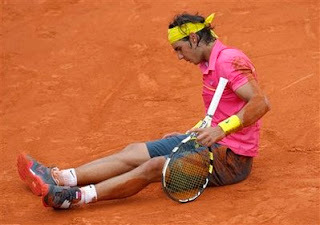 Rafa, pull yourself back together soon ok, and get that Madrid loss to Fed images off your mind too. And BURN that PINK tshirt, literally speaking. Novak Djokovic gone too, losing to Philip Kohlschreiber. Meanwhile, Safina is doing rather excellent with successfully causing 2 bagels already for her 2 opponents. Her brother, the handsome Marat Safin already left the turf much earlier losing in the 2nd round. At least people will remember him as a two times Grand Slams champion. Who am I rooting for FO men and women's single champions? I better not say.